Welcome to the Flapps review of 2016. This blog will give you brief reminder of some of the most important changes and improvements made to Flapps over the course of the year. As you can imagine, 2016 was an extremely busy year for our team here. Along with always trying to keep all those pesky bugs at bay, we have also focused intensely on adding new features as we continue to evolve our time tracking software. So let us take you on a whistle stop tour of 2016 and help rejig your memory on some of the bigger improvements to Flapps. We ended 2015 by introducing you to our new mobile attendance feature so what better place to start then with a return to our clock in and out system. Over the early part of this year we rolled it out completely and have improved all aspects of the feature. We also published a blog that gives you step-by-step instructions so you can make your own Smartbox. Our overtime section went through a makeover in the early part of the year and came out the other side as a slicker, all encompassing feature as a result. 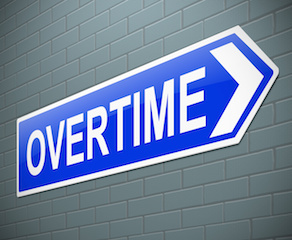 Previously the overtime feature was designed to log and display all overtime hours at the end of the month. However, we decided that allowing our clients the ability to have their overtime hours logged and displayed daily would be more useful. It means, for example, that an employee can work longer on a Monday in order to leave early on a Friday. Of course this is only a basic example and will also need to meet the requirements of overtime laid out by your company. If you check the convert overtime to time off box it allows you to convert overtime to time off on a daily basis. As we moved towards the end of spring we introduced a new Single Sign On (SSO) feature into Flapps. The SSO allows users to log in with a single ID and password to gain access to a connected system or systems, which in this case would be Flapps, without the need for different usernames or passwords. As companies continue to move away from the pervious model of using the directory service, i.e. several passwords to access internal and external applications, they are turning to the single sign on option. Implementing the Flapps SSO will have many benefits for your company. Some of these benefits include enhanced security, faster log in protocol and also reduced costs to your IT department due to a lower number of password related issues. Chronological time tracking was also introduced in late spring to the daily time sheet section. This is a useful feature if you have a company wide start and finish time. This new time tracking method is located in the Time Tracking section of the settings that can be accessed through configuration. This version of our time tracking was added as an extra option alongside Duration Time Tracking, meaning you now have even more time tracking options with Flapps. During the summer months we made some adjustments so employees now have their individual ID number visible when accessing their details through the employee tab. Previously the ID number was added during the process of creating and adding a new worker to the system. It was here that their personal number could be found. It is now visible beside the rest of their employment details such as their manager and their daily workload. This is an important extra to have when using our clock in/out system. As we headed into the fall season we decided to tweak the timesheet and improve it, making it even easier for project and line managers to use. The new changes to the set up means that a manager can now view the hours worked, including overtime, for each member of their team on a specific day beside the name of the employee. We also put a new notification icon into the project timesheet section so all project and line managers will be notified to any and all changes to timesheets. Once you select the icon you can then approve, reject, edit or delete the timesheets, as you deem necessary. The new version has resulted in improved overall performance. This all means that our security has increased once again and your data is even more protected. It is part of our company ethos to make our online software the most user friendly and the most secure product on the market. As you can see 2016 was a pretty busy year for us but we wouldn’t have it any other way. So all that is left to do is to wish you and your business the very best for 2017. We truly hope you continue to go from strength to strength. Happy New Year from all of us here at Flapps!